Has anyone ever told you to put super glue on a cut? Have others told you that it is toxic and should not be used? Both facts are true, but now we have special types of medical super glue that are non-toxic and seal cuts as well as stitches. Medical super glue, also called surgical glue or skin glue, is mainly used in operating rooms on both people and animals to seal surgical incisions, but it has lots of potential for improving the quality of emergency medicine as well. These glues stand apart from other liquid bandage products because they start to harden instantly on contact with skin and create a strong skin-to-skin bond that holds the cut closed. Stop the bleeding by holding pressure. Try to line up the edges of the wound as best you can. This is easiest with a clean cut like from a knife. Carefully uncover one end of the cut while still holding pressure. As you uncover the cut, apply glue, and wait until it dries. Carefully uncover more of the cut and repeat the process until the cut is completely sealed. As you uncover the cut, it will probably start to bleed despite your best efforts. The blood will mix with the glue, forming hardened bubbles and lumps. This is normal, and while it may not look pretty, the main goal is to stop the bleeding. SAFETY: Cyanoacrylates, including Superglue, Vetbond, GLUture, Surgi-Loc and Dermabond, can cause powerful exothermic reactions when they mix with cotton, leather, or wool. When using cyanoacrylate glues, be careful not to let the glue come in contact with clothing made from these materials. In the hospital setting it’s not always advisable to use surgical glue. Using Vetbond or Dermabond on infected cuts, puncture wounds, or injuries with ragged edges can seal bacteria inside the body compounding the problem and delaying healing. In the emergency setting things are a bit different because we are only worried about the short term. Stop the bleeding, and let the doctors figure out the rest. When doctors treat wounds with ragged edges they have to think about minimizing the scar tissue after the wound heals. In an emergency the #1 priority is to stop blood flow until you can get to a hospital. Do your best to line up the wound edges, and the emergency room doctor can decide how to proceed. The glue is dissolvable in triple antibiotic ointment in a matter of minutes, so don’t worry about any permanent consequences from screwing up. While wearing cotton or wool gloves. On wounds where you can’t pull the edges together. On wounds that don’t bleed much. Found to promote significantly more granulation tissue growth during animal studies. Surgical glue is one of the most frequently used items inside my first aid kit for both medical and non-medical applications. Dermabond dries strong and flexible. It is FDA approved for use on humans, and it is an excellent first aid product. The downside is that it is expensive and comes in single-use applicators. Vetbond dries extremely fast, but it isn't as strong or as flexible as Dermabond. It can easily hold a wound closed, but the patient needs to be careful to avoid rubbing it off. Vetbond's two main benefits are that it is much cheaper than dermabond and comes in a multi-use bottle. GLUture tries to be the best of both worlds by mixing the two cyanoacrylate glues together. If you're looking for a stronger glue than Vetbond in a multi-use container, GLUture may be perfect for you. However, it is more expensive and doesn't dry as quickly as Vetbond. GLUture may have a shorter shelf life than Vetbond since the n-butyl-cyanoacrylate is mixed with 2-octyl-cyanoacrylate. 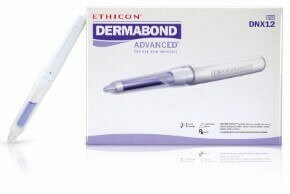 Surgi-lock 2oc is a cheaper, non-FDA approved version of Dermabond. Its packaging is a bit annoying because you need a seperate pipette to apply the glue, but it will certainly save you money. 2-octyl-cyanoacrylate (Surgi-lock 2oc) also has a shorter shelf life than n-butyl-cyanoacrylate (Vetbond). Cyanoacrylate glue can be dissolved using triple antibiotic ointment (Neosporin), so don't worry about causing problems with stitches at the hospital or doing a poor job closing the wound. The goal is to stop bleeding as soon as possible. Use 3M Medical Transpore tape to pull the cut together after it's glued. This will take some of the tension off the glue and protect it from rubbing off too soon. Dermabond is single-use and too expensive for non-emergencies, but Vetbond works great to seal and protect ripped cuticles or skin cracks. Povidone iodine or chlorhexidine should be used to clean cuts before applying surgical glue because other antiseptics may interfere with the integrity of the glue. Davis, Kyle P., and Robert W. Derlet. "Cyanoacrylate glues for wilderness and remote travel medical care." Wilderness & environmental medicine 24.1 (2013): 67-74. Sabol, T. Vasilenko, and P. Gal. "Intradermal running suture versus 3M (TM) Vetbond (TM) tissue adhesive for wound closure in rodents: a biomechanical and histological study (vol 45, pg 321, 2010)." EUROPEAN SURGICAL RESEARCH 45.3-4 (2010): 133-133. Steiner, Z., and J. Mogilner. "[Histoacryl vs Dermabond cyanoacrylate glue for closing small operative wounds]." Harefuah 139.11-12 (2000): 409-11. Bruns, Thomas B., and J. Mack Worthington. "Using tissue adhesive for wound repair: a practical guide to dermabond." American family physician 61.5 (2000): 1383-1388.